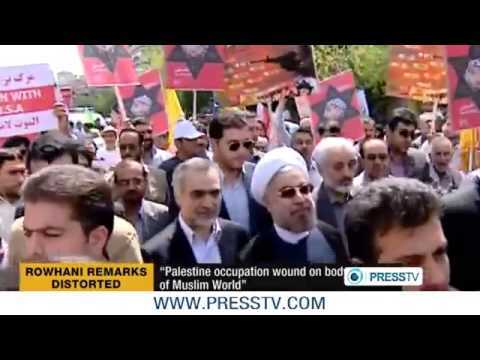 Oh, look, an Iranian president said something about oppression and occupation in Palestine and his words were mistranslated, misinterpreted, widely condemned and proliferated by warmongers as evidence of hatred and aggression. Obviously, this comes as no surprise as we've all been here before. And yet again, the accusations are not true. Speaking to reporters during a rally on Quds Day, Iran's Palestinian solidarity commemoration held annually on the last Friday of Ramadan since 1979, incoming Iranian President Hassan Rouhani - whose official inauguration takes place August 4 - described the day as an opportunity for people to "present the unity of Islam against any type of oppression or aggression," explaining that, "in our region, it is an old wound that has been sitting on the body of the Islamic world, in the shadow of the occupation of the holy land of Palestine and the dear Quds. And this day, in fact, is a remembrance that Muslim people will not forget this historical right and will always stand against oppression and aggression." These words were erroneously reported on a number of Iranian news sites, and from there spread rapidly through the international press, as having included a reference to "Israel" or "the Zionist regime" as a "wound" or "sore" that "needs to be removed." Rouhani's actual comments made no specific mention of the State of Israel or its government, nor did they note that such a place or leadership required excising. Unsurprisingly, hysterical reactions by Israeli officials and their media mouthpieces were swift and predictable. Israeli Prime Minister Benjamin Netanyahu immediately insisted that through the alleged statement, "The real face of Rouhani has been exposed earlier than expected," adding, "Even if his comments will quickly be denied – that's what the man thinks and that's the Iranian regime's game plan." Of course, any comment questioning the ultimate perfection of Israel and the nobility of the Zionist project is subject to intense and immediate pushback by agenda-driven groups, politicians and pundits. Accusations of genocidal intent and annihilationism abound. Even after the mistranslation was (immediately and admirably) exposed by numerous observers and analysts, corrected and Rouhani's statement regarding Western-imposed "oppression and aggression" in the Middle East and the description of the occupation of Palestine as a "sore" or "wound" on the region made perfectly clear, commentators like Jeffrey Goldberg still refused to acknowledge their over-reaction. A tweet on Goldberg's Twitter feed with the fabricated quote remains uncorrected. Goldberg's smug triumphalism is not only pathetic, it also reveals his ignorance as to the common usage - both historically and recently - of such terms to describe the Zionist colonization of Palestine and the ongoing Israel/Palestine impasse. No, no, no. But what I think is that this constant wound, that this constant sore, does infect all of our foreign policy. The lack of a resolution to this problem provides an excuse for anti-American militant jihadists to engage in inexcusable actions, and so we have a national-security interest in solving this, and I also believe that Israel has a security interest in solving this because I believe that the status quo is unsustainable. Considering the interviewer to whom Obama said this was none other than Jeffrey Goldberg himself, one would think Rouhani's language wouldn't alarm him so much. Back in early 2003, in a lengthy essay published in Foreign Affairs promoting the coming invasion of Iraq, neoconservative pro-interventionist Michael Doran even described "Arab-Israeli conflict" as a "festering wound" in which "several million Arabs chafe under unwanted foreign rule." The Palestinian-Israeli conflict is part and parcel of collective Arab identity; a constant reminder of contemporary Arab history full of dashed aspirations and deeply humiliating experiences. It is seemingly unending, with repeated episodes of suffering over which Arabs have no apparent control. It is an open wound that flares up all too frequently, representing the very humiliation Arabs seek to overcome. In fact, the reference to the imposition of the Zionist project on Palestine and the Palestinians goes back over 90 years, all the way to the British parliament. On June 21, 1922, during a session in the House of Lords discussing the implementation and parameters of the Balfour Declaration, parliamentarian George Clarke (Lord Sydenham) argued, "What we have done is, by concessions, not to the Jewish people but to a Zionist extreme section, to start a running sore in the East, and no one can tell how far that sore will extend." He predicted the ultimate failure of the Zionist experiment because, in his words, "the harm done by dumping down an alien population upon an Arab country—Arab all round in the hinterland—may never be remedied." As history has shown, this "running sore" has yet to be healed, but - in the meantime - the place called Palestine has all but been wiped from the map. Yet another thing to note may be that, in 1988, the Vatican's Pontifical Commission Justice and Peace issued a report called "The Church and Racism: Toward a More Fraternal Society", which condemned doctrines of superiority, lamenting that "in sharp contrast to this growing awareness of human dignity, racism still exists and continually reappears in different forms. It is a wound in humanity's side that mysteriously remains open." It also explains that "[t]here are different degrees and forms of racism," including discrimination based upon "ethnic origin, color or language." "Today apartheid is the most marked and systematic form of this: change is absolutely necessary and urgent here," the report states, "There are, however, many other forms of exclusion and rejection for which the reason invoked is not race, but which have similar effects. All forms of discrimination must be firmly opposed. It would be hypocritical to point a finger at only one country: rejection based on race exists on every continent. Many practice a discrimination in fact which they abhor in law. Respect for every person and every race is respect for basic rights, dignity and fundamental equality." The apartheid analogy is applicable with regard to Israel, of course. And as usual, the continuing obsession with Iranian rhetoric, to the exclusion of all historical context, remains transparently propagandistic. Portions of this piece were originally published on Mondoweiss. August 8, 2013 - Professor William Beeman, chair of the Department of Anthropology at the University of Minnesota, has provided some additional, edifying analysis of the (mis)translation of Rouhani's comments. Beeman, formerly an anthropology professor and director of Middle East Studies at Brown University and currently a visiting professor at Stanford University, has been a Middle East specialist for over three decades and is the author or editor of more than 100 scholarly articles, 500 opinion pieces and 14 books, including Language, Status and Power in Iran, and The "Great Satan" vs. the "Mad Mullahs": How the United States and Iran Demonize Each Other. A fluent Persian speaker, Beeman's expertise in sociolinguistic interaction and cross-cultural linguistics provides particular insight into this latest episode of exaggeration and exploitation when it comes to assessing the statements of Iranian leaders. The two terms that have been overly interpreted in President Rouhani's remarks (and remember, they were made on the fly in response to a reporter's question--not in a formal speech prepared in advance) are zakhm, which has been rendered in English as "wound," or "sore," and Al-Qods, which is rendered as "Jerusalem." The translation of both of these words may be dictionary-accurate, but they really do not mean the same thing as their English counterparts. Zakhm is an all-purpose word for the results of an injury or a surface infirmity on the body. Thus it encompasses a much broader meaning than wound, sore or injury. Used as a metaphor, it can even refer to emotional distress. It is really wrong, in my opinion, to treat it literally even as a metaphor. A zakhm is not "removed" no matter what the Iranian press initially said in their unfortunate addition to President Rouhani's remarks, but it can be healed, treated or "get better" on its own. When I first heard the Iranian press translation, I thought the word must be lakkeh, which is generally "spot," or "blot" which can certainly be removed. 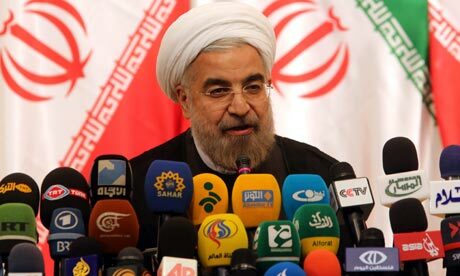 When I heard the original, the broad meaning of President Rouhani became clear. The other term, Al-Qods is certainly translated as "Jerusalem," but it is the spiritual Jerusalem which is not bounded by specific territorial demarcation. The English term "Holy Land" really comes much closer to the meaning of Al-Qods. There is a perfectly good Persian word, Orushalem, for Jerusalem to refer to the actual city. Thus the people who want to claim that President Rouhani is talking about the state of Israel are really straining hard to use this use to talk about an attack on the state of Israel. All that said, it is quite unreasonable,. in my opinion, to interpret an answer on the fly in a press event as "state policy," as was done, and especially wrong to insist on maintaining an interpretation based on a mistranslation even after the correction was made clear. August 9, 2013: A week ago, when this story broke, Michael Doran - a former Bush administration official and constant champion of U.S. military aggression, Western-backed regime change, and Israeli hegemony - chimed in via his Twitter account. Correction: According to Rouhani, Israel is not a wound to be eliminated, it's just a "sore," which, of course, he will fix! Now recall what Doran wrote himself of Israel and Palestine a decade ago, as noted above. The "Arab-Israeli conflict," he wrote in Foreign Affairs, "is a festering wound" in which "several million Arabs chafe under unwanted foreign rule." Keep up the snark, Mike. It's what you're best at.